A Plan is composed of one or more Charges that control the billing frequency, amount, etc. The Charges will be a combination of the Charge Type and Pricing Type. The Charge Type indicated how a particular plan needs to be charged be it on Usage Based..etc. Bulk: This indicates that the quantity is used to select the pricing tier. For Eg, your customer can pricing their product depending on the different tiers mentioned in the pricing tier. If the quantity falls under one of the pricing tier then that amount will be considered for billing. E.g., if your tiers are 0 - 10 = $5 and 11 - 50 = $10, and the final quantity is 15, then the amount billed would be $10 since that is the tier under which the quantity (15) falls in. Tiered: This indicates that the amount is the combination of Qty and Pricing tier. For example, your customer can create multiple tiers depending on the quantity and quantity will be multiplied by the price. E.g., if your tiers are 0 - 10 = $5 and 11 - 50 = $10, and the final quantity is 15, then the amount billed would be 15 X $10 = $150. Contrast this with the Bulk Pricing model above. Unit: This indicates that the the price depends on the quantity mentioned. The quantity is multiplied by the price mentioned in the system. This is equivalent to tiered pricing with a single tier. 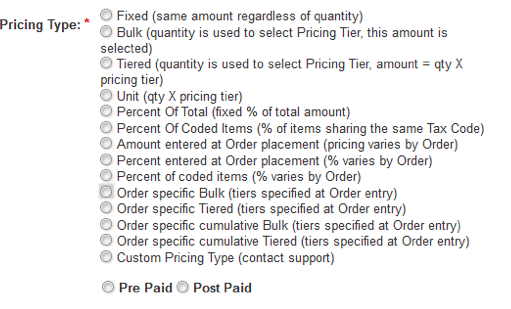 Order specific Tiered: This is similar to the Tiered Pricing model except that tiers as well as the price can be specified at the time of Order placement. Any values entered on the Edit Charges screen will be used as the default tiers when you go to create a new order, but with this model it can be overridden at the order level. This is usually used when you negotiate prices for each customer, and they all have different tiers (either the tiers itself or the pricing for the tiers may vary) . Order specific Cumulative Bulk: This is a special case of the Bulk pricing model, where the tiers are cumulatively applied. E.g., if your tiers are 0 - 10 = $5 and 11 - 50 = $10, and the final quantity is 17, then the amount billed would be $5 + $10 = $15.